This post contains affiliate links for which we are paid a small percentage when you make a purchase. 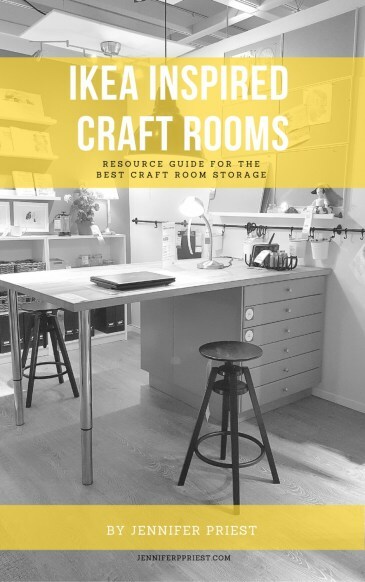 I received some of the product featured in this post for free from iLoveToCreate, Kunin Group Felt, and Plaid Crafts. When I got invited to be a part of a DIY fall wreaths hop, I was skeptical. The instructions were to make a wreath that wasn't covered in acorns and the color orange – that's a “tall order”! Then it hit me – PUMPKIN. SPICE. LATTE. 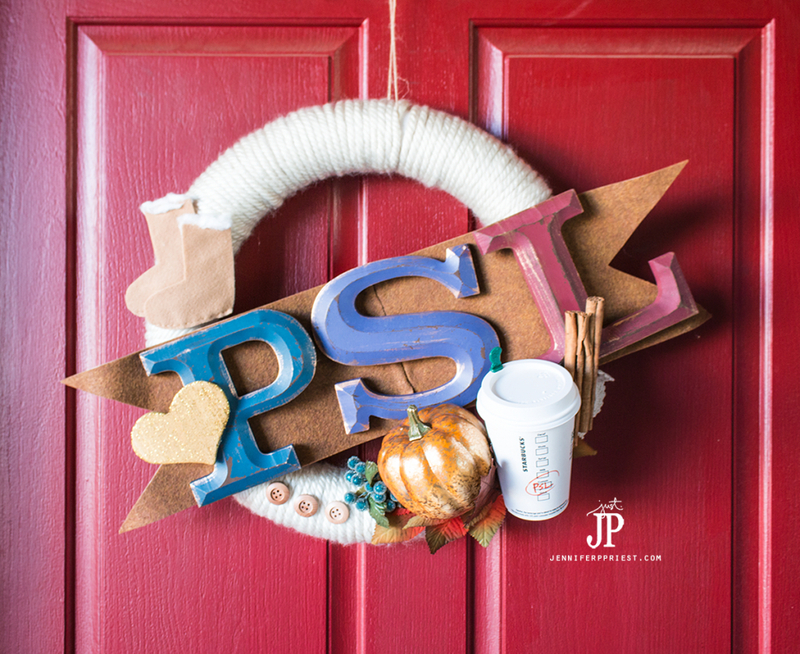 This DIY Pumpkin Spice Latte inspired fall wreath was so much fun to make and surprisingly affordable. It's everything fall without the wheat sprays and obligatory orange leaves. Okay, it does have some of those but only a sprinkle *wink wink*. The key to this wreath is the genuine Starbucks coffee cup on the front of the wreath. When I told the guy at the Starbucks counter what I was doing, he gave me a cup in each size. Talk about customer service! You definitely want to use a fresh, clean cup for this DIY wreath project. You can refer to this meme for guidance. It was on the internet so it must be true, right?! Starbucks cup with PSL marked on the side. Because PSL. Fake sheepskin boots. I don't wear them but I was almost trampled at Starbucks by women padding by softly on their way to PSL heaven. So Uggs for sure. PSL letters. Just in case someone dos NOT know what I am trying to say. Or they want to bring me a coffee before knocking on my front door. Cinnamon sticks. You know, “spice” and stuff. Pumpkin. Really, you want me to explain that one?! Yarn because sheepskin boots go with chunky sweaters. 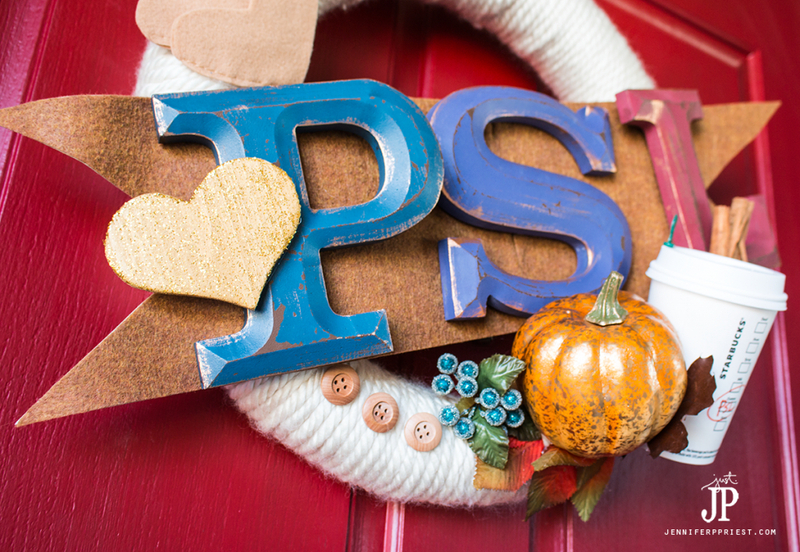 Every wreath wishes it was a chunky sweater with a PSL and wooden buttons. Fall leaves and baubles because in case the message is not clear, this is a FALL WREATH, y'all. P, S, L letters – I got these on clearance at Michaels this week. It's the letter motherlode over there right now! This project takes about 2 hours to complete – the wrapping of the wreath form with the yarn is what will take most of the time. But it is OH so worth it, right? I would LOVE if you made one of these and shared it with me!! Ready for more wreath ideas? Hey Jennifer, you surely had a great time putting together this wreath and no doubt it will make everyone smile and feel ‘fallish’ when they come to your door. 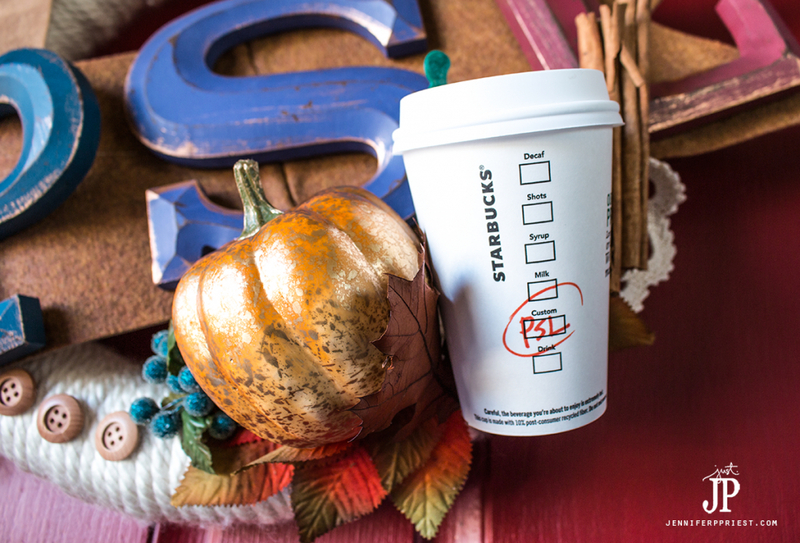 I love your PSL theme…because…PSL! And now you’re making me feel the need to head to my local starbucks…in my uggs of course! Haha uggs right back at ya! Girl! This wreath is too much! I love it! 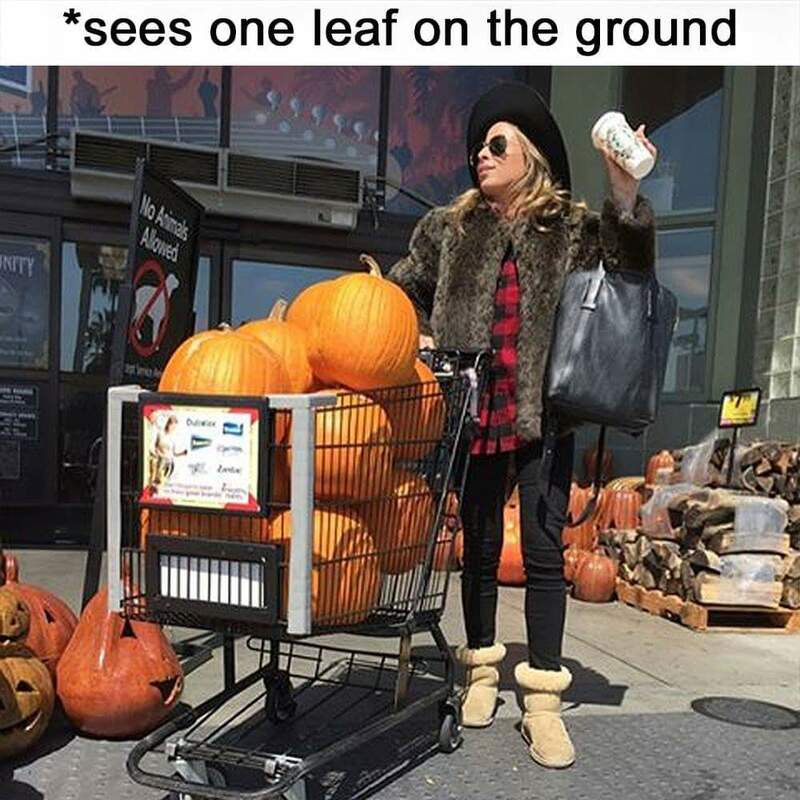 That first image “white girl with a PSL” is the true sign that fall is here hahaha not falling leaves. Pumpkin spice everything! I love how it turned out. So unique and super cute! Oh my gosh, Jennifer, this is so cute! It’s got everything I love about fall! This will be so fun to have on your front door! I adore your themed wreath. 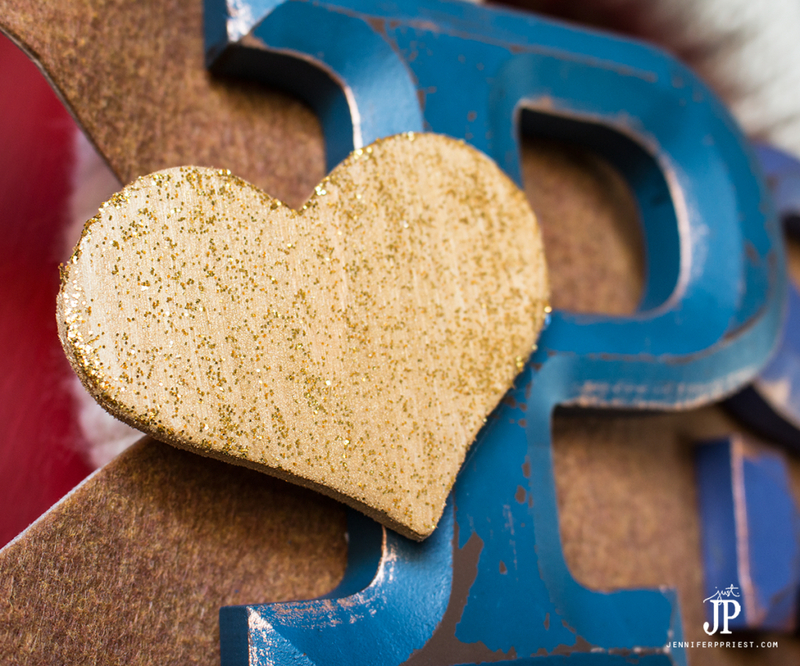 Honestly it represents everything we love about love! Nicely done! Love how fun and quirky this is!! So creative and unique. Thanks a latte for visiting! Haha, this is awesome!! Super creative and fun. Ha!!! Love this, so cute and creative! This is fantastic!!! Pumpkin Spice is definitely the flavor of the season. Love the wreath! haha!! Oh my goodness, this wreath is great! LOL! 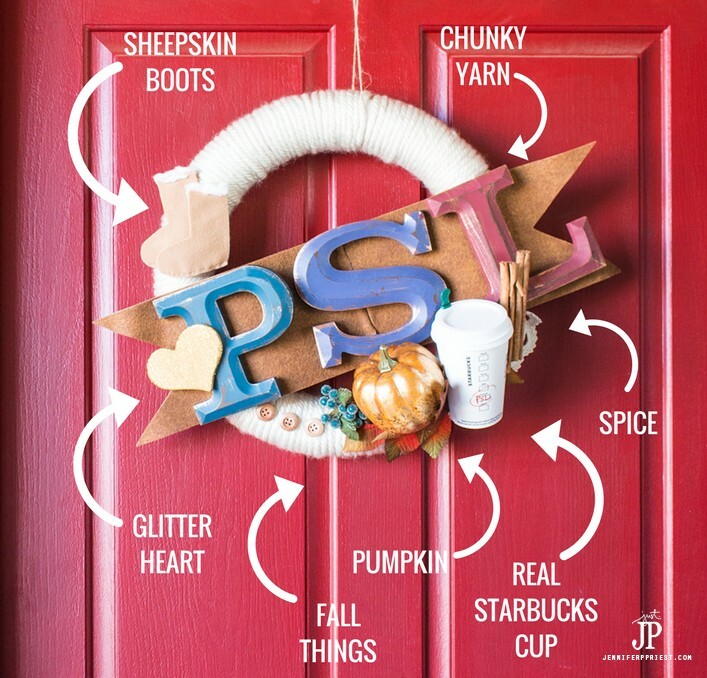 I am DYING laughing with you and your PSL wreath! OMG this is PERFECT!!! You are hilarious. LOVE IT! Hi I like all the wreaths,simply beautiful,yours I love its fun and not the usual kind.Thanks but I do not have a Starbucks near me,I live in a small town. Pumpkin Spice is my favorite drink & this wreath is hilarious. I love it! I’ll be featuring it tonight at Merry Monday.